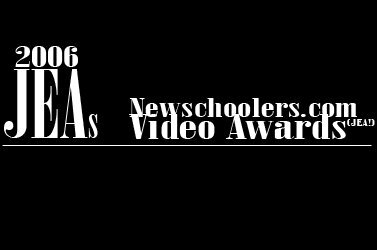 After a few weeks of hasty organization, Newschoolers.com is very proud to present our first-ever video awards: the JEAs!Since the forums here are always full of debate about the best movie, best skier, best trick, et cetera, ad infinitum, we decided to go ahead and make it official. Now you can nominate and vote for the movies and the skiing that have stoked you out the most this year!We’ve divided the awards into two categories, Pro and Amateur, so that NS can give props not only to the Mustafas of the ski community, but also to the young, playful Simbas who might one day grow up to be king of the jungle. And we've lined up some dope prizes for the ams from our official JEA Award sponsors listed below! Check out the descriptions below of each category, and then head for the Ski Gabber to nominate your picks for the JEAs. And if you're an am filmmaker ready to win an award, read the submission guidelines below and get us your movie! For more information, check out the nomination threads in the Ski Gabber, or drop an email to kamikaze@newschoolers.com.AM AWARDS- Since the ams are the lifeblood of NS, we wanted to give you more than mere fame! So we've lined up some swag from our official JEA Award sponsors: JIBIJ, DYNASTAR, SUBLUX, OBERMEYER and HIGH SOCIETY! (more TBA)We'll also be sending the winners some customized prizes, just from us. We're giving out a variety of different awards, from the Dipset award for best urban to the &quot;Who the hell were those guys? !&quot; award, so get us your cut and we'll see how you stack up!- Since most NS members will only see a few am movies, we're going to judge this category ourselves. If you want your movie in, you gotta send it to us or put it online for us to download. But we need to have your submission by DECEMBER 15, so hurry up, foo!Submission Guidelines- Include your name, email, phone #, address, and company name with your submission.- E-mail a link to your movie to kamikaze@newschoolers.com, or send TWO (2) copies of your movie to:Newschoolers.com753 Rue VersaillesMontreal, QC H3C 1Z5Canada**Remember, shipping will take at least a week,so hurry up! **PRO AWARDS- Nominate your pick for each JEA award category in the special nomination thread in the SKI GABBER. Nominations will be open until DECEMBER 1, 2006. Then we'll create polls for each award, and you'll vote on the final winner!- Pro award winners will each be awarded a page on Newschoolers dedicated just to them, and you tell us which page they should get! You can nominate an award page (here's one good example) in the SKI GABBER. Pro Award Categories- Best Film- Best Segment (male)- Best Segment (female)- Rookie of the Year- Best Line- Best Air- Best Jib- Best Edit- PB&amp;J Award (best mix of Park, BC &amp; Jib)- The Gallant Award (worst crash)Important dates:Pro nomination deadline (in the Ski Gabber forum): DECEMBER 1, 2006Am video submission deadline: DECEMBER 15, 2006 (must be received by this date! )JEA winners announced: DECEMBER 22, 2006!